A PDSA is a process in which we use small, simple steps to test a change idea. The feedback from the test guides us to our next step. Let’s try it out for just one appointment. OK, that’s done. What is the feedback? Does it work? What do we need to change? Lets try it out now for a morning session. Does this change lead to an improvement? or are we making things worse? The value of PDSAs can be seen when we think about other ways we might try and effect change. Dale Ford offers these alternative approaches. Which approach do you use in your organisation? In health, we usually try and figure out the whole solution before we make a change. Have we thought of every possibility? Have we got everyone on board? Is the path absolutely clear? That makes sense when prescribing a new medication or cutting someone open. But if we are trying to effect system change, it;s no wonder we never get to the ‘doing’ bit. And if we ever do, circumstances have changed so much that we are on the wrong track before we even start. Just keep doing stuff. Never test to see whether things are actually improving. Pilot study, anyone? Making a small change is a start, but unless you follow it up with action the overall improvement remains small. 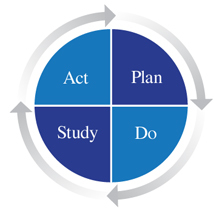 The power of the PDSA cycle is in the cycle – one small change leading to another leading to another. PDSAs – small, rapid tests of change – allow an ‘agile development’ model. It is a minimal risk approach to change. It allows us to start from where we are. Feedback ensures we are on the right path. We continue to ‘fall forwards’ and seek better solutions – always. Robert Lloyd, the Director of Performance Improvement at IHI, explains the origin of the PDSA and describes their properties in this ‘whiteboard lecture’.